At our urging, Jay who is Treasurer for Wawa, opened with his personal story. We learned how an LSU grad from New Orleans with a talent for playing the drums ended up working in the Philadelphia area at one of the major accounting firms. A turning point in his career came when he got a call that his young daughter, who was born with Downs syndrome, was in the hospital. He wanted to leave and his boss asked him, “Who is going to stay and do the work?” So he stayed and completed the work but started looking for other employment options soon thereafter. He was presented with two opportunities -- to be a big fish in a little pond or a little fish in a bigger pond (Wawa) and to the surprise of his colleagues he took what many considered to be a “step down” and chose Wawa. Starting as the Assistant Controller, Jay had to unlearn his “get it right the first time or take it away” approach and start learning the “Wawa Way”. Private ownership allows Wawa the luxury of thinking in the long term and not worrying about “this quarter’s earnings”. Wawa associates have a considerable share in Wawa’s ownership which has them take pride in their company. The Servant Leadership style of management is a non-traditional bottom-up approach “one in which, the executives are called to serve, support and nurture the associates.” If a leader is asked to leave Wawa it is not usually for incompetence but because they didn’t live the Servant Leadership model -- high turnover, associate complaints and lower productivity – in short, the people don’t want to be led by them. The six core values – Value People, Delight Customers, Embrace Change, Do Things Right, Do the Right Thing, and Passion for Winning are the flight path for the Wawa flock to follow. Jay shared with us that 50% of his annual appraisal is linked to his demonstration of Wawa’s values. Things that keep him and others up at night at Wawa include, among other things: competition in the fuel industry, a data breach and maintaining a pipeline of people. As a rule of thumb, their typical growth rate is 50 new stores per year with 25 in Florida, a primary target market. Leaving our Sounding Board™ session at their training facility, we ran into a group of new Wawa recruits walking in the door after lunch as we were walking out. One of the recruits held the door for us while the others applauded his efforts. So to answer your question Lisa, “How does Wawa do it?” It's either in their culture, their training or in their milk. We can't really say for sure. Thanks for the great visit Jay! p.s. 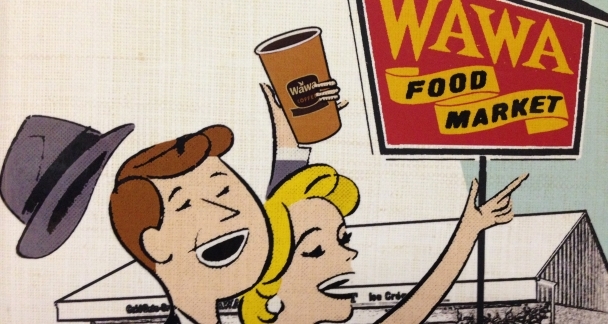 If you want to know more about Wawa, you can purchase their book, "The Wawa Way: How a Funny Name and 6 Core Values Revolutionized Convenience."